This past August, I traveled to the Netherlands. I’ve been there before, but never explored beyond Amsterdam. 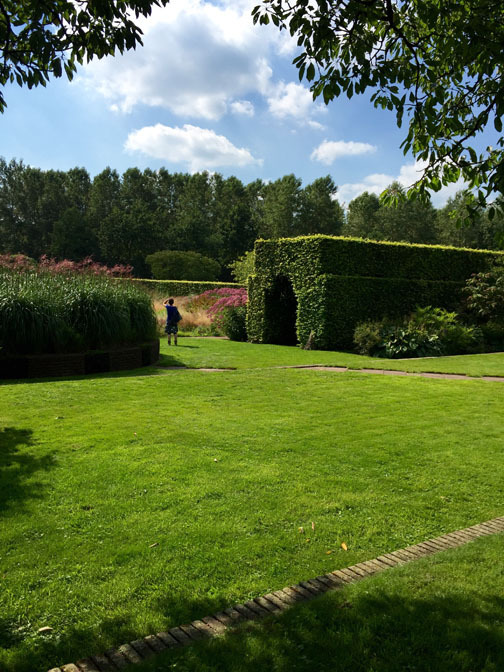 It was a great treat to stay in the eastern part of the country at a Dutch friend’s family place and make day trips to various gardens. Holland is about the same size as the state of Maryland. There are no fallow fields or areas of neglect; roadside plantings, though wild looking, are managed. Old- school forms of mowing, namely sheep, eat the grass and weeds along the roadside. Roundabouts are planted in a variety of garden styles. Every square inch has been touched by man. There is order-to everything here. That same attention to detail was present in the gardens I visited. Groups of trees were shaped into flat canopies for living pergolas. Remarkable numbers of trees are espaliered, and not just fruit trees; Ginkgo and Magnolias were carefully trained into mesmerizing patterns on a single plane. I’ve never seen so many shrubs sheared into fabulous forms. Lawns were perfect – no weeds. 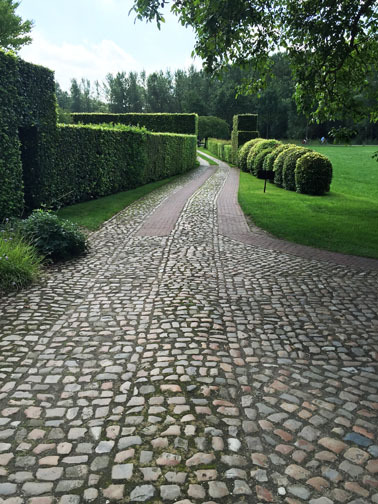 In villages you could see immaculate gardens in front of every house. It was lovely, but something was missing. Piet Oudolf is the Dutch Garden designer, who has achieved international fame with his prairie style influenced garden design. Photographs of Oudolf’s garden before he went to America show hedges clipped into waves or used as center pieces within the garden, and there’s a lot of lawn. All that changed after Oudolf came to the US. 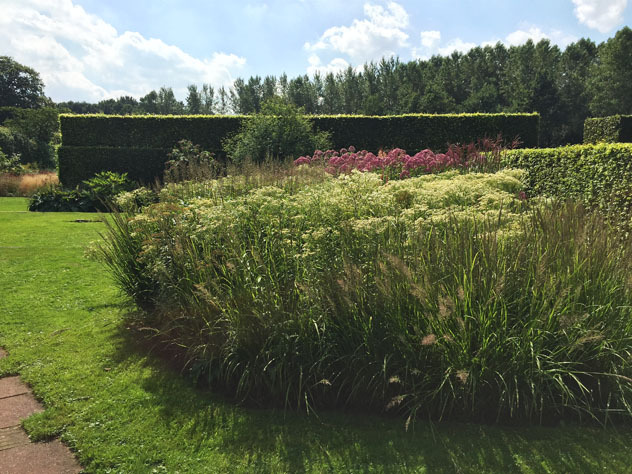 Considered the head of The New Perennial Movement after coming to America, Piet Oudolf developed a more natural style of gardening. By using grasses and meadow plants he pushed garden design forward by casting back and reclaiming what had been tamed. Was he perhaps gently suggesting it was time to let go a little, embrace the ways of the wild meadow? But American prairie isn’t framed. In those vast spaces, the eye blends the flowering plants and grasses, flattening out the textures and colors. With no verticality, the viewer experiences the plants as a mass. 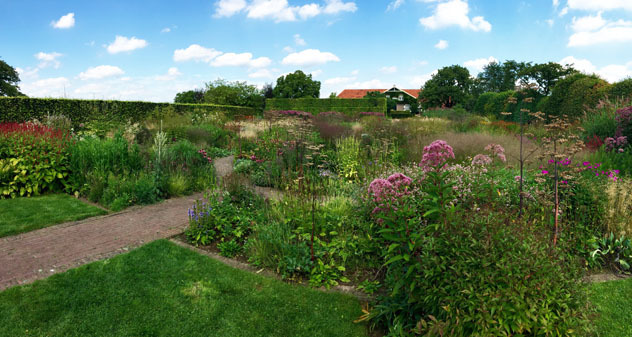 In an Oudolf garden there is an added element – the frame. Best known in America for his public work, which includes Battery Park City and The High Line in NYC, and The Lurie Garden in Chicago. Oudolf ‘s prairie- like plantings are juxtaposed to -and contained by- the city’s buildings. This perspective heightens the viewer’s awareness of plant life, and enables us to appreciate plants wild, cultivated en masse and individually in every season. 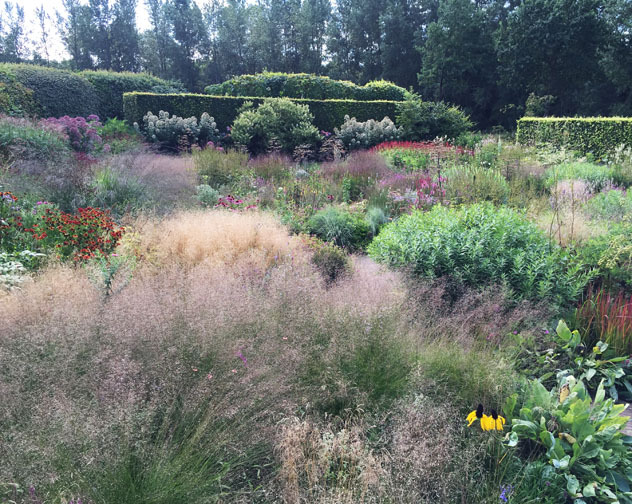 Like the best innovators what is excellent about Oudolf’s work is what he chose to keep and what he let go. At Hummelo, Oudolf’s own garden outside Amsterdam, American and European perennials are artfully enclosed within tall hedges (no waves or center pieces) that serve to frame his meadow -style plantings, as sharp background, to softer plumes of grasses, seed heads and a large variety of wild and cultivated flower shapes. 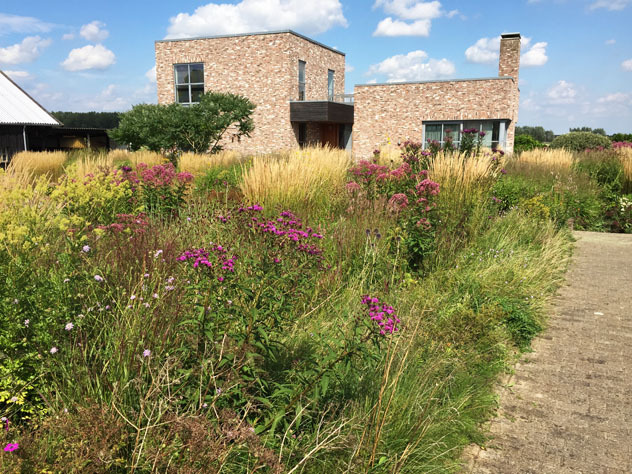 In each instance, Oudolf takes the prairie’s endlessness and contains it within a context. 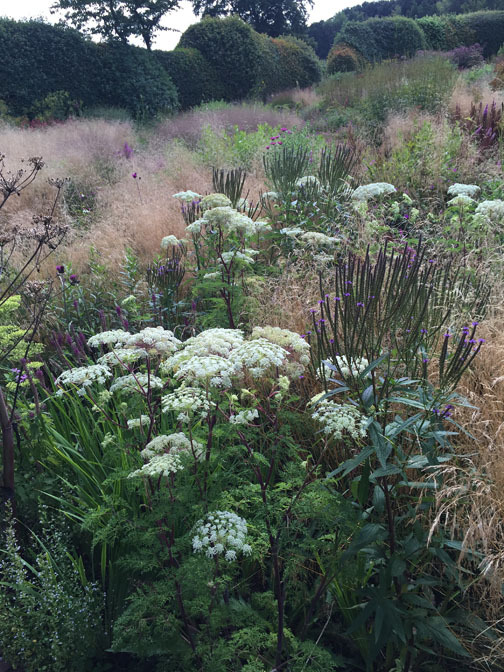 How did Oudolf get to this stunning combination of the tame and the wild? Oudolf’s was a nurseryman. 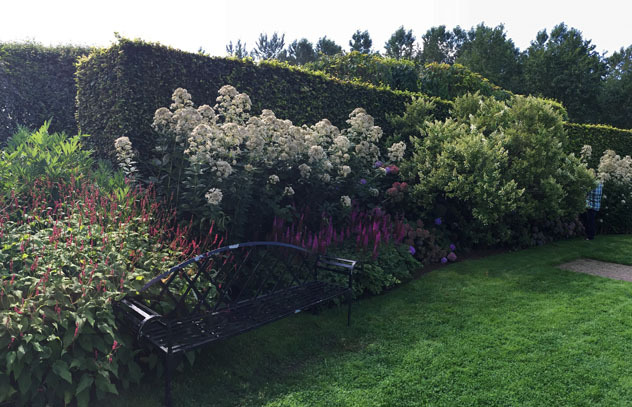 With his wife Anja, he spent years growing and observing the habits of hundreds of perennials and developed a deep knowledge of how plants behave in each other’s company. This knowledge is paramount in his garden design. He chooses the plants that stay put, don’t spread, root or takeover other plants, and don’t need constant dividing. 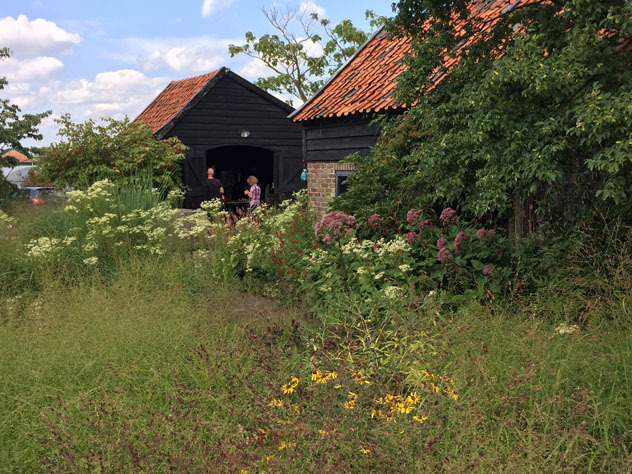 This is how he creates stunning, sustainable, wild- looking plant “communities” (a word Oudolf often uses) that get along. We must have made the grade. 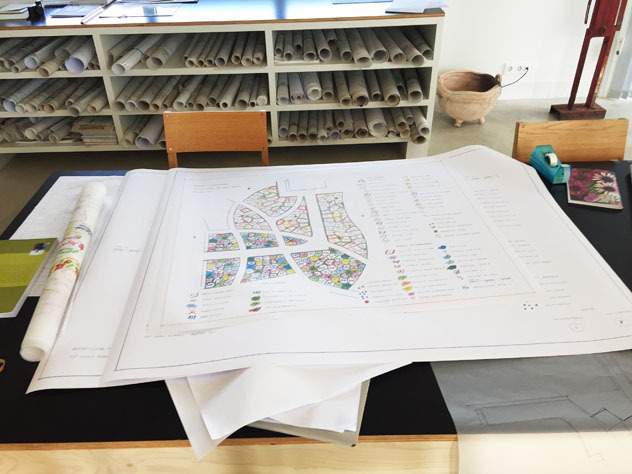 First Anja swept us off to Oudolf’s design studio where we saw a mass of planting plans in progress. From there we walked into the newest part of his garden surrounded a courtyard between old nursery greenhouses, now used for storing carefully covered vintage cars, (I’m pretty sure one of of the cars was a Cadillac.) Two- foot -wide paths, were kept clear of flopping plants by discreet wires, meandered through the plantings. Instead of lawn and formalized iconic hedge shapes. grasses such as panicum virgatum, and calamagrostis were the largest forms and giving a strong sense of structure throughout. Many native American perennials: asters, Eupatorium- Joe Pye weed, Helenium -sneezeweed, Veronia -ironweed, and echianceas- coneflower, dotted the landscape. Nothing cut back, rather seed heads are left, their lovely deflowered forms add visual weight, as well as doing the vital job of feeding the birds. 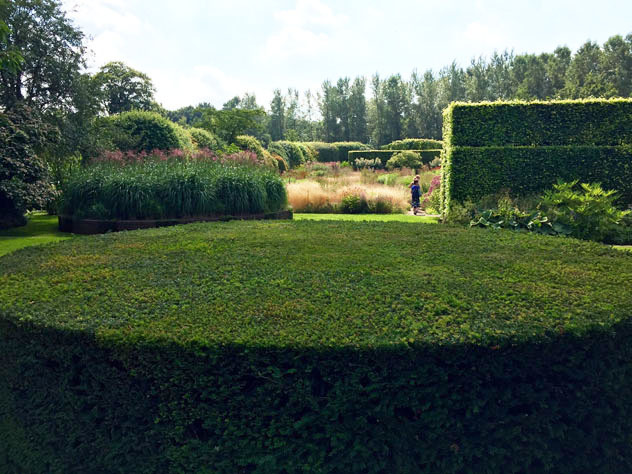 As we moved through the garden into a large hedge- framed meadow, I was not prepared for the scale of the plantings. 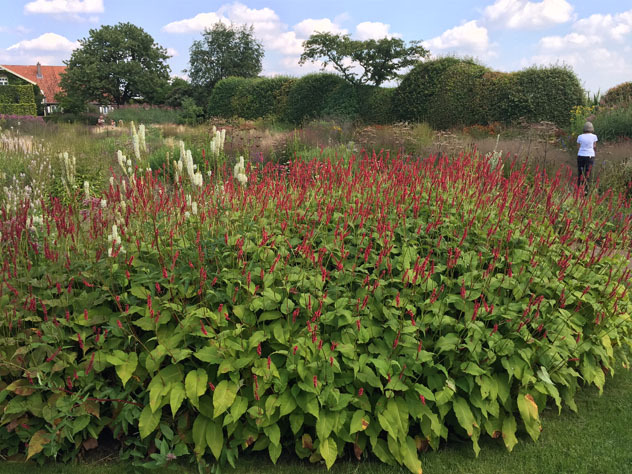 Instead of lawn, vast expanses of plumed grasses , red persicarias abutted clouds of lilac asters, and sweeps of giant Joe pie rose up to six feet. I was surrounded and contained- like the plants, in a living, glowing tapestry. Returning home, I was bowled over by the chaotic mess of my own ignored garden. I went into a deep decline. My wife had promised to keep the lawn around the borders mown. But completely ignoring the traditional straight lines of classical mowing, she had embarked on her own -“free style pattern”, with varying heights of grass- from bald to tufts six inches high- in random patterns. My once -beautiful lawn appeared to have a bad case of mange! It wasn’t completely her fault. The day I left on my trip, temperatures had soared into the nineties and stayed there for weeks. She is Celtic, and although she has lived in the States for 20 years, she can’t can’t abide the heat. As for my borders, I felt equally repulsed. It was the beginning of autumn, and the party was over. My plants, while still beautiful up close, looked collapsed and spent. It took about a week for me to see the irony of the situation. 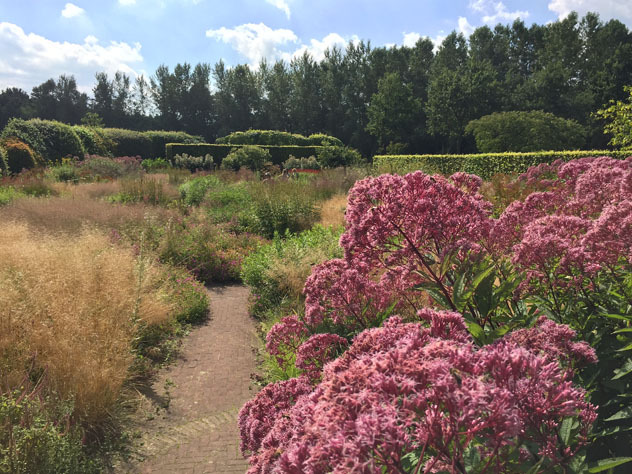 I had worshiped at the altar of Piet Oudolf’s American prairie inspired garden and returned home unable to abide the very wildness he had built his designs around! Gradually, I started to see again the beauty of the wildness around me. As I drove the back country roads, ditches filled with the asters’ blue glow; plants in their various stages of turning, chartreuse, yellow, orange, red and shades of green; a Virginia creeper running amok up an old sugar maple; screamed out confidently. I realized my trip to Holland was not made so I could return home and copy Dutch gardens, but like all travel it woke me up and showed me what I was taking for granted. 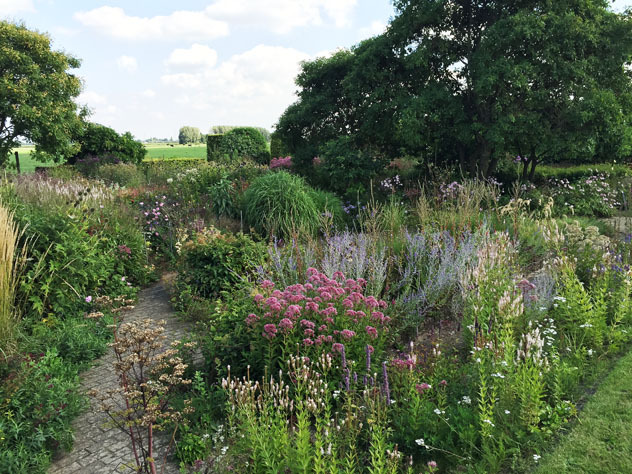 Oudolf took the knowledge he’d honed as a nurseryman and his travels to the prairies here, to create a sustainable natural style of gardening that incorporates all seasons. The popular New Perennial Garden style spearheaded by Oudolf, offers a much- needed romantic version of a once- wild landscape. There is an urgency to reclaim what Europe has lost. In a myriad of different ways, European countries are wonderful, and if we compare our efforts to them, there is bound to be some heart-ache. But these countries are also so crowded, that there’s no room left for the wild. Perhaps the heartache that comes with comparison is more about what we have and aren’t paying attention to, than a desire for another reality. As Americans we can appreciate and protect the savage jewel that we still have. My trip renewed me. I see a wilder path ahead. Oudolf is generous with his planting plans. You can find a list of the plants he used at the Lurie Garden online. There are also many books written about Oudolf’s design methods. I encourage you to read some of his collaborations with the English garden writer Noel Kingsbury which are particularly insightful. Gallery | This entry was posted in Meadows, Piet Oudolf's Gardens and tagged Battery Park City garden, High LIne, Hummelo, Piet Oudolf Gardens, The gardens of Piet Oudolf, The Lurie Garden, The New Perennial Movement. Bookmark the permalink. Some of your gardens already have a hint of wildness. It will be interesting to see the direction you take them. Kathy its true about the wildness in my garden. From my patterned meadow (areas where I let the grass grow all summer) and mow once a year to letting the wild grasses and perennials in along ditches, banks and in garden rooms I try and let in as much of the wild plants as I can. Of course I do edit some of the plants that show up removing golden rod, rosa multiflora from around the pond. I am not sure where I am going with all of this, but I do find inspiration from The New Perennial Movement as well as The Native Plant Movement. Superb article and photos, Don. I am thinking differently about my own garden now. Thanks! Great report, Don. I garden in a quasi-meadow style within a more formal structure, with the beautiful view of Mount Beacon as a backdrop. The drought and the resultant water restrictions we’ve experienced this year has made me even more aware of the value of meadow plantings; they soldiered on while the more exotic plants, not so much. Thanks for reporting back to us. The photos are gorgeous. 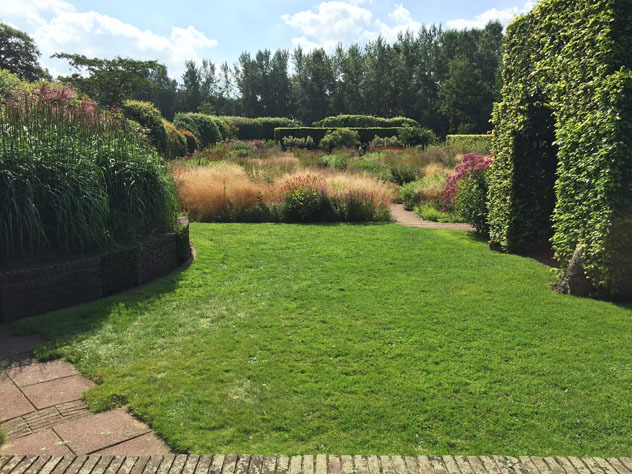 I hope to get to The Netherlands soon to see it’s gardens myself. You raise another good point Joan about our amazing views in NY state. So many of my gardening friends would not want to contain a meadow planting within a hedged room because the views beyond the garden are spectacular. The majority of gardens I saw in Holland looked onto agricultural fields and the near constant winds sweeping over the flat land desperately calls for a shield for garden plantings. Very engaging, thought provoking, and personal post, Don. I wonder where this will take you. It sounds like a fabulous visit. Thanks James, I was blown away by the nurseries I visited in Holland which I will post about in a future blog post. One of things I have taken away is to try and edit the garden by creating better plant communities. I will have a lot of holes to fill in my garden come next spring. I too am curious to discover how this visit will affect your own garden, Don. Your post provokes a more general question, as well. 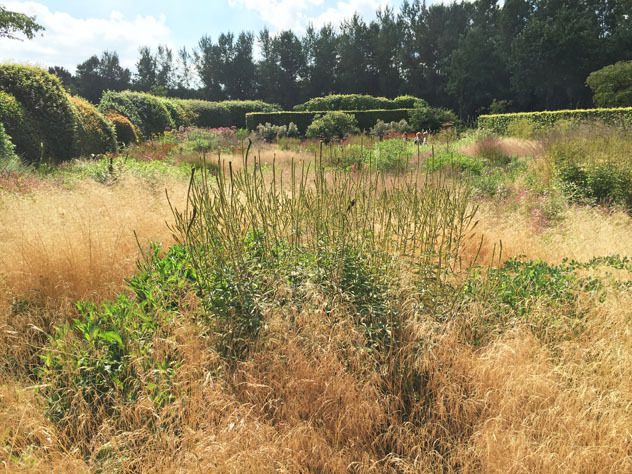 Do you think there is a difference in the ‘dialogue’ that takes place between Oudolf’s planting approach and the wider landscape when seen in a European garden or in a North America setting? I’d be very interested to know what other readers think, too. That’s a really good question Pat, and one that I struggle with. Where gardens are situated has a tremendous amount to do with what to plant in them. 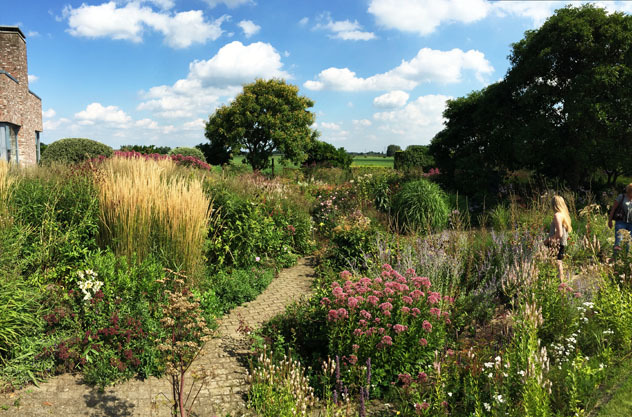 I have never seen an Oudolf garden surrounded by the wilds of an American landscape, but I can imagine that garden would look very different from one surrounded by a managed agricultural or urban setting. In Holland I saw golden rod -Solidago planted in peoples borders. Best as I can I eliminate it from anywhere in my garden because my fields are full of it. 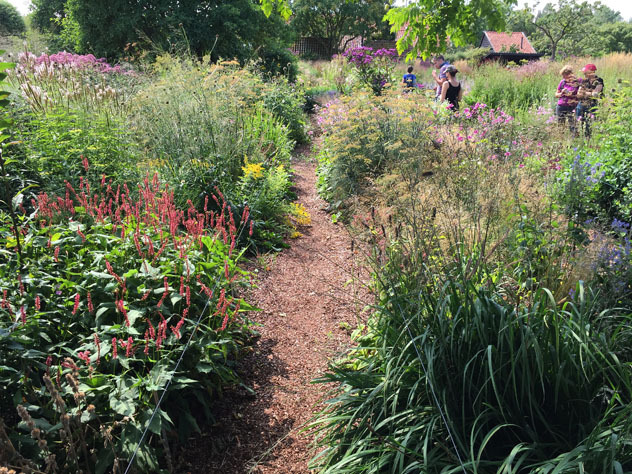 Likewise, when I have written about Oudolf gardens before, gardeners in my area of upstate NY tell me that they look at fields of grasses and wild perennials in their everyday landscape, why would they want a garden of grasses! This issue speaks to Annette’s comment about eliminating my lawn. My lawn serves as a buffer between my borders and the totally wild landscape I live in. So many of my gardening choices though at first might appear aesthetically driven, are also practical. If I didn’t shear the grass between me and the wild landscape I would have a progression of wild roses and tree saplings advancing on my house. Thank you for this response, Don. You and I are struggling with the same issues. We have a large, and to my eyes quite beautiful, lawn that defines the space around the house. Unfortunately it also attracts Canada geese, making it virtually unusable. So we have started the process of converting it from lawn to something more like a meadow with a few mown paths, based on our belief that the geese prefer short grass. The conversion process will take a few years, I think, and will involve a lot of experimentation and study on my part. I don’t plan to end up with an Oudolf-type planting but with something less decorative. Nature will have its own ideas. I really enjoyed your post Don, and your take on the New perennial movement. I am inspired by Oudolf’s design style and live near the Flint Hills Tallgrass prairie in Kansas which is miles and miles of prairie. I do not take advantage of the area I live in as much as I should. i formally did landscape designs and installations. I have incorporated many natives recently as compared to more exotics in the past in my gardens. I hope to imitate more four season interest and create more pollinator and wildlife friendly areas in the garden.